Many institutions and individuals have built enormous followings on social platforms like Facebook and Pinterest by posting vintage photos, other types of old images and local history links. Achieving success on social channels is not difficult but it does take time, thought and planning. The best way to build an online following for yourself or your organization is to post interesting, relevant content regularly. As you continue to post, you will gain insight into the topics that interest your audience the most and the least. Social platforms are not broadcast media. Because there is no buffer, no filter between you and your customers, you can talk to them directly. Find out what type of events they’d like to attend. Run a survey. Ask for suggestions then incorporate this valuable market research into your program planning. It should positively impact your visitor numbers and your bottom line. The key is to provide enough interesting material to keep people engaged and attract a steady stream of new followers. Let’s look at some tried and true ways to make that happen. Contrary to what you may have heard Facebook is not dying. It has more than one billion active users each month and is still growing. Don’t make the mistake of thinking older people are not part of the mix. People 55 and up are the fastest growing demographic on Facebook and 76% of them visit the site daily. It’s safe to assume your current audience as well as those you’d like to attract are on the platform. You should have a business page as well as a personal profile. On Facebook but not sure which you have? You get and send friend requests on personal profiles. Business pages collect “likes.” If you need help getting started with Facebook or setting up a business page, contact me. I’ll gladly walk you through it. To build an interesting post, all you have to do is select one of your vintage images and describe it. For example: The Union Depot was on Second Street where the Parking Partners Lot is now. It was built in 1898 and torn down in 1937. This shot was taken about 1900. If you don’t have much information on the image, post it with questions. “Anyone know where this building was or what it was used for?” is usually enough to get the ball rolling. Vary your posts. Men and women are drawn to different sorts of images as are younger versus older people. Pay attention to what your audience reacts to. They will let you know what they like and want to see more of. Even if you are posting historic shots exclusively, you’ll get a different reaction to a picture of women in elaborate hats and a bridge being blown up. Engage with your audience. Don’t ignore comments. When someone takes the time to comment on a post, acknowledge them. Liking someone’s comment shows him or her that you read it. If people ask questions, answer them. If you don’t know the answer, say so. Get personal. Be friendly. Use people’s names. Thank them for visiting. Humor can work. The person who manages the Pioneer and Historical Society of Muskingum County’s Facebook page has a dry sense of humor. He’s not running a comedy page by any stretch of the imagination, but his personality shines through in almost every post. I’m sure the witty tone of the page has contributed to audience growth. Are you worried about negative comments? Don’t be. Deal with them. Eventually someone will probably post an inappropriate comment on your page. If the comment is innocently stupid, you may choose to ignore it. However, if it’s over the top, offensive, or spam, or if it just bothers you, hide it or delete it. Depending on the nature of the comment, you may also want to ban the commentor. You must keep an eye on what’s happening on your page. Don’t let things get out of control. 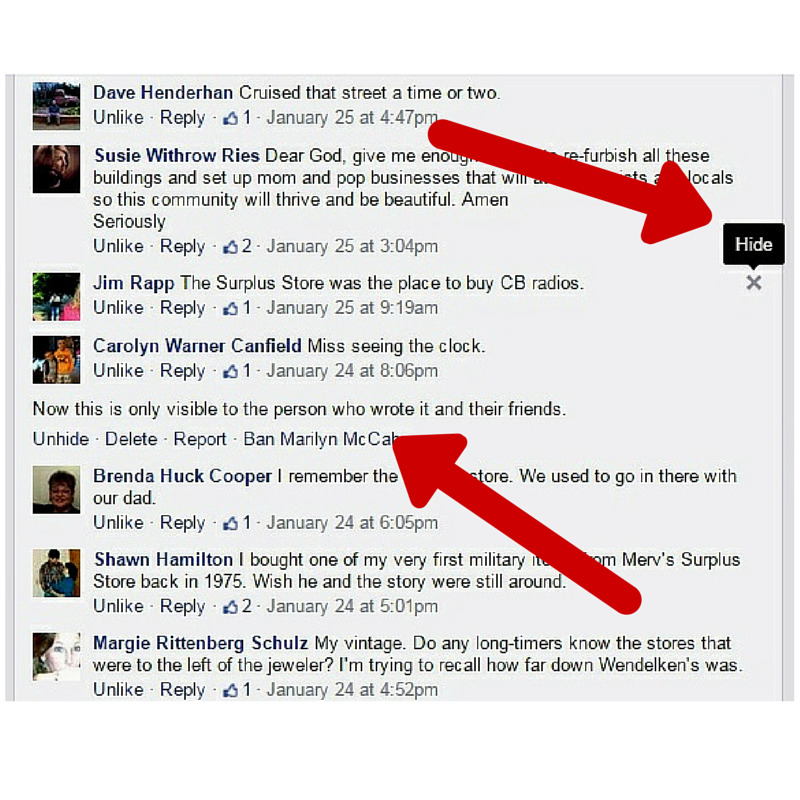 Hover your cursor over the small arrow in the upper right corner of the comment to reveal the Hide button. If you click it the offending comment will disappear and the message "Now this is only visible . . ."highlighted by the second red arrow comes up. At that point you may move on, delete the comment completely and ban the commenter if you like. Consistent and frequent posting is critical. If you only post once or twice a week, you’re wasting your time. Very few people will see your updates. The Facebook newsfeed is like a fire hose. Thousands, maybe millions, of posts are generated each minute. Facebook uses a mathematical formula to decide which posts make it into a given person’s newsfeed. The formula is based on what that individual has liked and engaged with in the past. You can significantly increase the odds that your material makes the cut by posting interesting images with short descriptions a few times each day. I can hear you groaning, I don’t have time for that! No one does. This is where an editorial calendar comes into play. Take a look at the upcoming month or the next few weeks. What’s on the schedule? Any programs, events, lectures, tours, shows? If yes, then structure about half of your posts around that event. If nothing’s on the schedule, get creative and see if you can find a theme. Are there any important dates in local history or holidays like Mothers’ Day in the near future? Take a look at Holiday Insights. They list “bizarre, unique and wacky” holidays for almost every day of the year. If there’s nothing obvious on the horizon, go through your vintage picture collection and come up with your own structure for the next several days. Monday will be street car day. Tuesday I’ll post pictures that include horses. Wednesday will be about local bars. Thursday will be for churches. Don’t overthink this. Just pick something and go with it. Facebook includes a scheduling feature that allows you to set up posts in advance, an incredible time and sanity saver. I post on the Hidden Marietta page four times a day. I generally set up three or four days at a time. That means I only work on posts twice a week. I do keep a close eye on the page but I’m free to work on other projects as my Facebook updates post away in the background. When you schedule posts in advance, stay flexible enough to step in and change or delete a post if need be. A horrific plane crash will make your innocent post about a stunt pilot from the early days of aviation look insensitive and in very bad taste. If you are not doing so already, follow the social media accounts of a few large organizations like the British Museum, Mount Vernon, Colonial Williamsburg and your state historical society. Notice how often they post, what kinds of images they use and how much information they provide. Follow their leads. For an effective page with a narrow focus, try the Bata Shoe Museum. Bata keeps things moving by weaving relevant posts and information from other sources into their stream. You should also follow local organizations whose audiences overlap yours such as bookshops, libraries, antique stores, local nostalgia groups and vintage clothing retailers. If one of these groups posts something interesting or announces a program you think the people who follow your page might enjoy, post a link. You can also share links to articles, blog posts and videos. Special posts can liven up a sluggish page. Here are a few ideas. Then and Now –Nothing illustrates how much things have – or have not – changed better than a Then and Now photo comparison. Not only are these before and after type shots incredibly popular, they are easy to create. Select a good historic image of a building or neighborhood. Put a copy on your phone or print one and take it with you to the site. Shoot several new pictures from approximately where the person who took the original picture was standing. In other words, try to duplicate the shot. Choose the new picture that most closely matches the original. Then display the shots side by side. Then and Now shots are perfect for Facebook. They also work well on your website. You can even add them to business cards and posters. Shooting in black and white or creating a black and white version of the new image can make the side-by-side comparison with the old photo even more dramatic. Another possibility is to combine the old and new photos into a blended image. We talk about editing and special effects in Part 4. History Quiz – Set up an ongoing quiz, one question per post. Do it the same day each week. 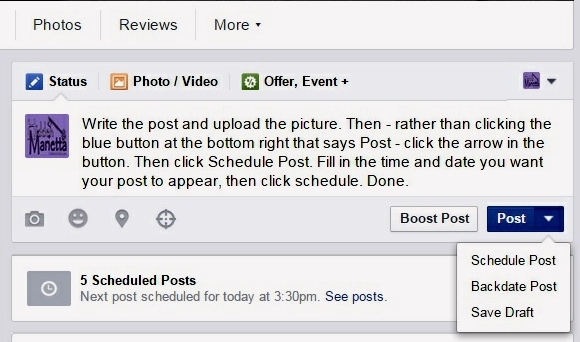 If you are posting twice a day, come up with two questions, two illustrative or complimentary images, pop them into Facebook scheduling and that day is taken care of. Your goal is to involve the audience. Get them commenting, guessing and sharing with their friends. Questions do not have to be elaborate or complicated to inspire engagement. They do, however, need to be difficult enough to be interesting. For example you might post a picture of an old school and ask: This school was torn down in 1962. Do you what its name was? Where was it located? Did you or anyone you know attend classes there? Storytelling – If you have several shots of a single event such as a flood or blizzard, or a sequence of shots over time such as a building under construction or being torn down, set up your posts to tell a story. Spice up your descriptions. Caption a photo of a historic fire like this: “Dateline March 9, 1904.We interrupt regular programming to bring you a news bulletin! Flames raced through the Palace Theater this morning. The cause of the fire is unknown. Details as soon as they become available.” Then a few hours later, post another picture with additional information or maybe some background about the theater. Oddities – Do you maintain a collection of artifacts or objects? Does it include any items that would baffle most people? Remember, just because you know that odd looking utensil is a Victorian marrow scooper doesn’t mean Mary Smith who is following you on Facebook does. If you have real mystery items, things no one has yet identified, by all means post their images online. You’ll have an army of volunteer researchers combing the internet for clues. It’s hard to tell what they’ll uncover. Online scavenger hunts – Just as people enjoy trying to figure out what an unknown object is, they also like trying to identify mystery locations and decipher other sorts of puzzles. 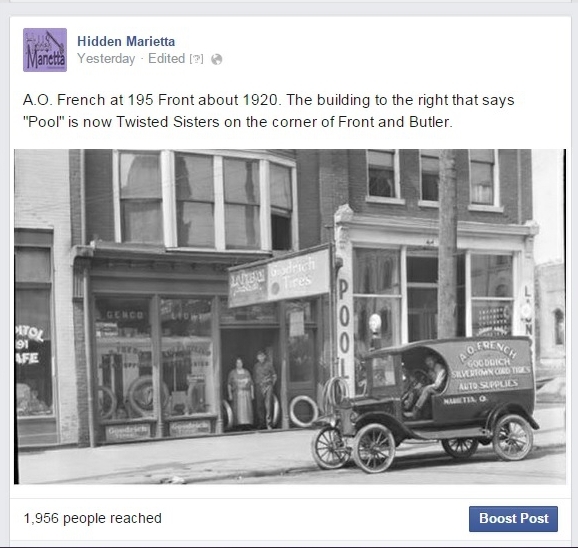 I ran a ghost ad series on the Hidden Marietta Facebook page a few years ago. Ghost ads are the faded advertising that clings to the walls of old buildings. To set up the series, I drove around town and took pictures of all the ghost ads I could find. Nothing complex. I used the camera in my phone. I cropped the images to remove identifying clues such as the wall of the building next door or other recognizable landmarks. I posted the images of the ads on Facebook one by one over several days and simply asked where they were. Although some ads were identified immediately, others turned out to be more difficult than I anticipated. The ghost ad series sparked a lot of engagement in the form of comments and shares and attracted dozens of new followers to the page. Many people admitted they had not noticed the ads before and said they were now looking closely at buildings they had taken for granted. An alternative way to run a ghost ad series is to ask people to decipher the ads, which is much more challenging. You can set up the same type of online hunt with weather vanes, interesting towers, distinctive roof lines, windows, doorways, etc. Take a drive around town and really look at what’s there. Don’t forget your camera. It all starts with good photos. Do you have a gift shop? Take pictures of the things you have for sale. Do you have staff or volunteers? Take their pictures and introduce them to your audience. If you work alone, post a picture of yourself. Any big projects going on? Is the backyard being dug up for a gas line? Did you get new carpeting in the office? Is the rose garden in bloom? How about pictures of the staff putting up Christmas decorations? Take pictures of people attending your events, visiting your attraction or going on your tour and having fun. You can use these event pictures again to market future programs. Behind the scenes shots work well. Let’s say you just received a Civil War-era lady’s bonnet. It’s been lying in a trunk for a very long time and unfortunately has mildewed. Take pictures that show the steps your staff is taking to clean and protect the bonnet from further damage. Don’t post all the pictures at once. Set it up as a series, as a developing story. People will look forward to the next shot. Have a selfie contest for your visitors. Ask them to post pictures of themselves at your attraction or event. I realize this may sound silly to some of you, but people love this. Plus the friends of the people in the selfies, even those who haven’t liked your page yet, will see the pictures. Please DO NOT dump a huge number of photos onto Facebook all at once. Respect your audience and make it easy for them to enjoy your posts. No one is going to open an album with 70 plus pictures in it. Select a few of your best shots. If they need to be cropped or modified, take the time and care to do so. Then post just those shots. You’ll get a much better response. Pinterest, like Facebook, is a powerful visual social platform. Even though Pinterest is smaller – a mere 70 million active users – you should consider using it. Once you have prepared your images and written descriptions or captions for Facebook, adding the content to Pinterest is a quick and easy process. 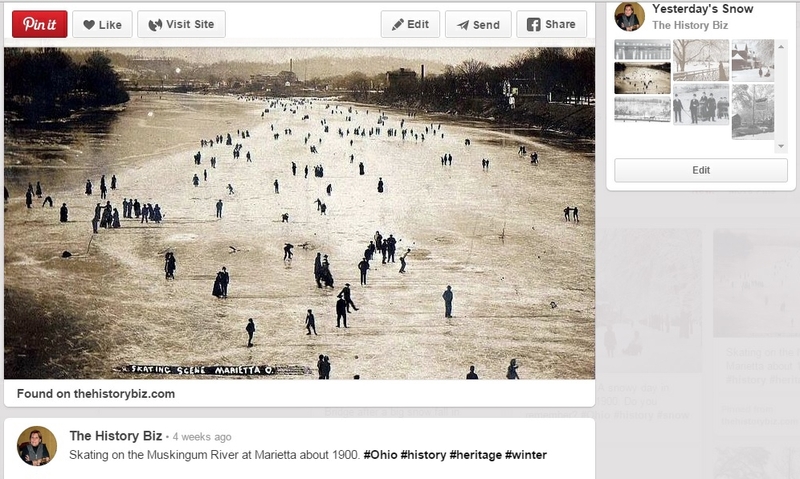 If you are not familiar with Pinterest, open a personal account and give it a spin. Spend a few days getting to know the site and how it works. Start pinning images of things you like. Once you get the hang of it, convert your personal account to a business account. This will allow you to establish a verified link to your website and give you access to Pinterest analytics. Pins and boards (essentially posts) on Pinterest are indexed by search engines like Google. Becoming active there will help new people find you. Make sure you add a “pin it” button to your own website so visitors can share your content with their Pinterest followers, another way to reach out. Learn about Pinterest here. Let me know when you start pinning or if you are already on Pinterest. I’ll be glad to follow you. I’m at The History Biz. Coming up next in the final part of this series we'll talk about using vintage images in offline marketing. We'll also take a look at several ways to build complimentary programs and events around old photos.